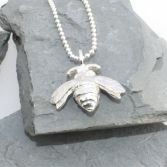 My Bumble Bee Necklace is exclusive to JBJ handcrafted by me and cast in Britannia silver. 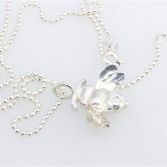 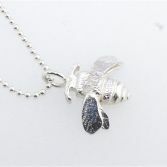 The Bumble Bee is made from Britannia silver which is a higher quality grade than sterling silver. 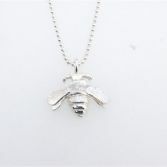 The Bumble Bee Pendant is provided with either a strong 1.5 mm sterling silver ball chain which is available in 16'' 18'' and 20'' or a strong sterling silver Belcher chain shown in the picture also available in 16'' 18'' or 20'' please use drop down option to select. The Bumble Bee Necklace has been fully hallmarked at the Edinburgh Assay Office and all our sterling silver or other silver is sourced from reputable UK bullion dealers. 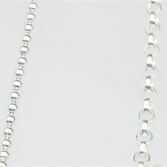 If you require a different type of chain or length then please do email me: julie@juliebrandonjewellery.co.uk. 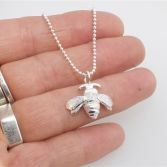 Your Bumble Bee Necklace will be presented in one of my signature gift boxes and posted via Royal Mail special delivery (signed for) to any address in the UK free of charge.